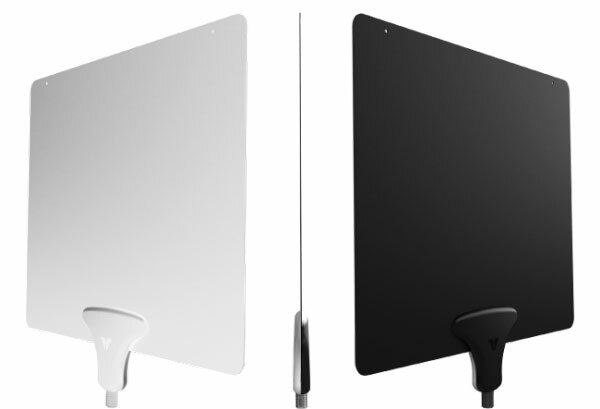 Review summary: The combination of a small sleek design, positive reviews and low price make the Mohu Leaf our pick for the best indoor HDTV antenna. When you want to cut the costly cable company cord, your first consideration should be how to get all of your network favorites over-the-air. And for that, you'll need an HDTV antenna. Except choosing one that will work best for your setup isn't easy. Local geography, terrain—both natural and man-made—broadcaster antenna location and even your feng shui room arrangement affect how well any particular HDTV antenna will operate. 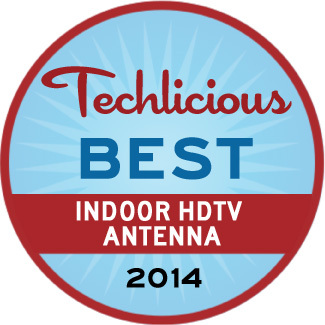 This means there is no universal "best" indoor HDTV antenna. An expensive, amplified model may perform no better than a plain old set of rabbit ears—and it may actually perform worse. "In our tests, performance varied wildly—so much so that we couldn't really rank [tested antennas] in order of performance, as a model that did well for one tester couldn't pick up any TV signals for another," admitted our friend Jim Willcox at Consumer Reports. "TV antennas are notoriously hard to recommend," agreed Tim Moynihan at The Wire Cutter. "When you throw in the unpredictable performance variations between locations, it's nearly impossible to come up with a 'one size fits all' pick." "One problem with finding the right TV antenna is separating marketing spin from actual results," reports Consumer Search, "and that's complicated by the fact that an antenna that works great for one person because of their locale could be a miserable failure for someone living even a short distance away." In my case, when I tested the Mohu Leaf, I could receive no channels in my living room. 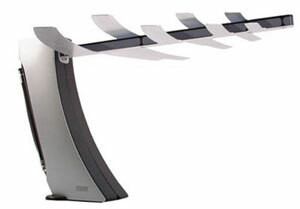 In my home office, however, I could receive 21 stations by placing the Leaf as high as possible above my TV using the included coaxial cable; I could only receive 18 stations when I strung a longer coaxial cable so I could place the Leaf on a west-facing window. At the end of the day, prepare for trial and error. You may have to experiment with placing the antenna in varying locations around your abode. Four models that fit all or most of these criteria kept cropping up: the Mohu Leaf, the Terk HDTVa, the Winegard FlatWave and the RCA ANT 1650. Based on our criteria, the Mohu Leaf ($39.99) came out as our top choice. The Leaf and the slightly larger Winegard FlatWave stand out for their attractive and unique design. Most indoor HDTV antennas are ugly, pointy things like the Terk HDTVa or flat, black pieces of hard plastic like the RCA ANT 1650. The Leaf and the FlatWave are as thin, light and flexible as the cardboard that new shirts come wrapped around. They're white on one side and black on the other, so they can be painted to match any décor. And they're light enough that they can be tacked to a wall or attached by adhesive Velcro pads (included). With the Leaf and FlatWave being virtual doppelgangers, the Leaf edges out the FlatWave based on its smaller size—12.5” x 11.5” versus 13” x 12”—and a much deeper pool of positive reviews. While the Mohu has piled up the most reviews and most impressive user reviews on Amazon (4-star average from over 6,600 reviews), what's more interesting is the number of consumers who've reportedly switched from a competitor to a Leaf—far more than vice versa. Reviewer R.S. stated "[t]he Mohu has done a better job picking up UHF digital television than other antennas I have tried, including the Terk Indoor Amplified High-Definition Antenna and the RadioShack Amplified HDTV Antenna." "I had the Terk HDTVa Indoor Amplified High-Definition Antenna for Off-Air HDTV Reception prior to this," reports Illz Zats from the antenna reception hell that is New York City. "Boy was I stunned when the Leaf right out of the box picked up 27 channels." "The Mohu leaf is the best interior digital TV antenna on the market today," agrees self-described gadget guy B. Jennings. "I used a powered RCA antenna before buying the Leaf. I could pull in 16 channels. I put the [L]eaf in the same spot and picked up 20." Professional reviewers in their in-home testing were also impressed. "Wait, how can a cheap-looking, paper-thin piece of plastic do a better job pulling down TV signals than powered rabbit ears?" rhetorically muses Rich Broida at CNET. "No idea, but it does. … But, holy crap, the Leaf works like magic. My TV picked up every local station and tuned them in at nearly full signal strength. Your mileage may vary, of course, but I'm absolutely astonished by how well this thing works." Mike Flacy at Digital Trends makes varying recommendations based on specific conditions and circumstances but notes that "the sheer amount of programming picked up by the multi-directional Mohu Leaf is really astounding for the slim design. While you do have to spend 15 to 20 minutes finding the ideal placement on the wall to pick up the maximum amount of high definition programming, the end result is fantastic for the $40 price tag." In his technically exhaustive comparative antenna study, HDTV expert Pete Putman declares "Among the basic flat antennas, I still prefer the Leaf—it's smaller and more esthetically pleasing…and it's been a reliable performer everywhere I travel." 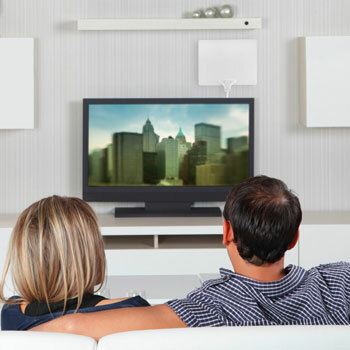 No one HDTV antenna is perfect for everyone due to geographic considerations. That said, the Mohu Leaf has gotten thousands of great reviews from consumers and reviewers across the country, not only for its reception, but also for its sleek design, making it our pick for the best indoor HDTV antenna.